The colored boy is cured. 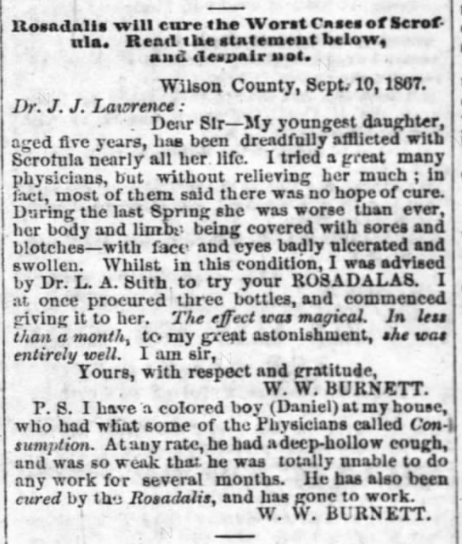 In a testimonial about the miracle of Dr. J.J. Lawrence’s Rosadalis, The Best Blood Purifier in the World, W.W. Burnett mentioned that Daniel, a colored boy at his house, had been cured of consumption, or something, and had gone back to work. The North Carolinian (Wilson, N.C.), 15 January 1868. I opened a medical office in Wilson in 1858, but I moved to Goldsboro in 1861 to edit a newspaper. After two tours of duty in the Confederate Army, I resigned for health reasons to return to Wilson and become associated with Confederate Hospital # 2. I then established a drug store and also practiced medicine. I began experimenting with tonics and potions. I moved to Baltimore and Norfolk briefly before returning to Wilson in 1870. I started The Medical Brief in July 1873, which was called the “largest circulation and the most prosperous medical publication in the world.” I twice went bankrupt and moved to St. Louis in 1875. In 1879 I first trademarked my tonic “Listerine.” I died in my Fifth Avenue Mansion in New York sometime after 1904, and I left an estate of between 7 and 11 million dollars. Answer: JOSEPH JOSHUA LAWRENCE, A.M., M.D. This email, and any attachments thereto, is intended only for use by the addressee(s) named herein and may contain legally privileged and/or confidential information. If you are not the intended recipient of this email, you are hereby notified that any dissemination, distribution or copying of this email, and any attachments thereto, is strictly prohibited. If you have received this email in error, please notify me immediately and permanently delete the original and any copy of this email and discard any printout thereof.